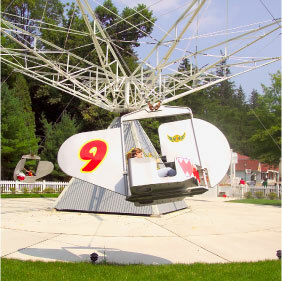 LIGONIER, PA – March 16, 2016 – Idlewild & SoakZone (www.idlewild.com), voted “Best Kids’ Park” in the world for six consecutive years, today announced that it will mark the 60th Anniversary of its beloved Story Book Forest theme area with the return of an Enchanted Castle and a new Princess character to delight and entertain children of all ages. What’s New At Idlewild For 2015 Season? May 20, 2015 - Idlewild & SoakZone (www.idlewild.com) is celebrating its title of ‘Best Kids’ Park in the World’ for the fifth consecutive year, and will open for its 138th season on May 22. Because you love to see them smile, Idlewild & SoakZone invites families to ring in summer with its new trolley ride, musical show and friendly puppet character. March 12, 2014 – The Fred Rogers Company (www.fredrogers.org) and Idlewild and SoakZone (www.idlewild.com) today announce that they are teaming together to bring the popular childrens’ character, Daniel Tiger, to the Ligonier amusement park, which was named ‘Best Kids’ Park in the World” for the fourth consecutive year. The main character from the award-winning animated preschool series Daniel Tiger’s Neighborhood on PBS KIDS, Daniel Tiger will appear at the park daily during the 2014 summer season. May 21, 2013 -- Defending its title of ‘Best Amusement Park for Children in the World’ like a true champion, Idlewild & SoakZone opens, Thursday, May 23 with a brand-new lazy river, Float Away Bay. October 3, 2012 -- The PHMC is excited to recognize Idlewild’s long history, its association with the famous Mellon family, and its ability to adapt to changing times and being recognized for the third consecutive year as the Best Children’s Park in the World. September 8, 2013 -- Last night, at its Annual Golden Ticket ceremony held in Santa Cruz, California, Amusement Today Magazine recognized Pennsylvania’s Idlewild & SoakZone as the ‘Best Children’s Park in the World’ for the fourth consecutive year.